Freedom Hostels@Phi Phi i Koh Phi Phi, Thailand: Bestill nå! Very nice Hostel. Everyone gets their own big locker to keep their stuff in and it keeps the floor free to walk around on. The bathrooms are clean, but there are only four showers and toilets, but that was not a big problem! I reccomend this hostel if you wanna live away from the partyarea, but close enough to join it! Very happy with my stay, it's a clean and alright hostel for the value. It's far enough away from the party so you can get a nice night of sleep but close enough so if you want to go out it's like a 10 minute walk. Aircon and good wifi is a big plus! 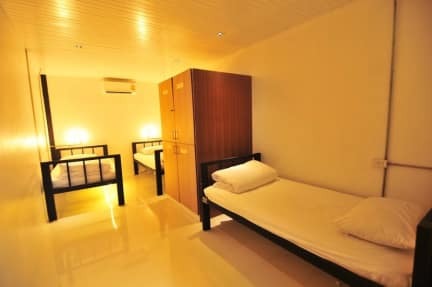 There is also good space and lockers in the room, and the fact that they have key cards makes it feel very safe :) only bad thing is that there is a lot of mosquitoes in the bathrooms, but just put on some repellent and you'll be fine. Good showers!